We’ve been reflecting on the shift that just happened at Justice GA. So many are reporting a difference. As a faith tradition, we seemed to have gone through a collective growth spurt. This is the third in a 4-part series featuring examples of how we experienced and observed health and transformation. When I work with a congregation on growth I will often ask them, how do people outside know you’re Unitarian Universalist? take a moment and think how you would answer that. For those of you who have never been to Phoenix in late June, let me tell you. It is hot. Really hot. Three digits hot. The City of Phoenix set up a water cart on the street outside the convention center where city workers in nice, orange polo shirts handed out fresh, cool water and constantly reminded us to stay hydrated. I found this so welcoming and caring that I stopped to tell one of them. “It’s a pleasure! We’re so glad you’re here.” The sincerity with which he declared this caught me off guard. If you asked a random person on the streets of your town what difference the Unitarian Universalists make in your town, what do you think the answer would be? What keeps you from inviting people you meet throughout the day to your religious community? I bought a soda from one of the food court eateries in the convention center. The woman behind the counter noticed my empty water bottle and cheerfully offered to fill it with ice and fresh water. What does it say about your religious community from the manner in which you welcome visitors? Remember back to the moment you first walked through the doors of a Unitarian Universalist congregation. What would have made a positive difference to you in the way you were or were not welcomed? What can you do to better welcome the visitor, the pilgrim? I bought a t-shirt from the Puente Movement that said, “Arrest Arpaio, Not the People.” And I wore it to the airport. Through security. I have to admit, I really wasn’t thinking about the consequences, and that is part of my white privilege and responsibility. One agent from the Transportation Security Administration stared at my shirt, and brought me into the reality of Arizona and other places. The TSA agent who looked at my id glanced at my shirt and then quietly leaned in toward me. “Are you one of the Yellow Shirts?” I gulped. “Yes, I am.” I stood a little straighter. “We’ll keep coming back, m’am.” Our eyes locking. We nodded to each other as I moved on through. How do you wear shirts or make statements that others might not be able to, because your privilege allows it and demands it? How do you show up for people who are too afraid to show up themselves? How do your partners in your community know that you are Unitarian Universalist by your actions? Those are some examples. How else did you experience and/or observe growth spurts at General Assembly? Please share your thoughts in the comments and include your name and congregation. Tandi- This reflection truly brought tears to my eyes. Thank you for sharing your insight, experiences, and questions. Again, I am so humbled by the gifts you share. Thank you! This series of columns is very moving and I appreciate them very much particularly from the the social justice perspectives you bring from such a focused GA experience. I have two questions that I continue to ponder, however, and perhaps there’s room to talk about them. The first question involves code words. Here’s part of a sentence from the latest column “because your privilege allows it and demands it?” The word ‘privilege’ seems to be oftentimes used by religious and social liberals as a derogatory word and code for someone who has power because of some configuration of labels. I will readily grant that as a middle aged straight white male in America, I have few worries on trips about profiling, extra searches, etc. However, that does not make me a somehow privileged person when it comes to economic hardship (I basically live from paycheck to paycheck), massive student loans, worries about people I am close to having illness, dying or without medical insurance. It doesn’t make me privileged when I sit in a room with other alcoholics nor does it make me privileged to have found spiritual practices that help my life that are equally available to others for free. Frankly I think the word is overused and can be seen as a subtle (??) way of dividing ‘us’ from ‘them’. So my first question is to ask how that word can be modified or used in a different way? Second question is about GA. I understand about 3700 folks attended which was a great number given location and theme. However, my guess is that it attracted those who would tend to be interested or passionate about immigration, justice issues, and so on. While all that is good, it suggests the potential of future GA’s being focused on specific areas of passion rather than all things to all UU’s? That mightn’t be a bad thing but from the numbers who attended, it’s likely to me that quite a number of folks didn’t want to go just because of hot temperatures and the potential for conflicts outside GA. Is the intent to encourage future GA’s to be ‘justice’ oriented? If so, whose justice? And if not, will GA’s of the future become more theme-oriented and less universal (forgive the pun)? So those are my questions. While I for one applaud all those who find social justice issues to be of great importance, I am of the opinion that that passion ought to be twinned with a robust theological grounding that gives people ample opportunity to reflect, go inward, become discerning, and to be sure they don’t burn themselves out ministering to the world. There is nothing quite like the bold, pronounced, unified visibility of the Love People when they get together. Tandi, I was surprised when I received my “Standing on the Side of Love” shirt and could not find “UUA” or a logo on it anywhere. Nancy and I wore the shirts as we were canvasing for support for Washington Marriage Equality at the Poulsbo Farmer’s Market, but it would have been nice if it were more obvious that we were UUs. Can anything be done about including a reference to the UUA somewhere on the apparel? Thanks. As you might know, the Standing on the Side of Love campaign was established with the mindset that it would be a slogan under whom anyone could (metaphorically) march. 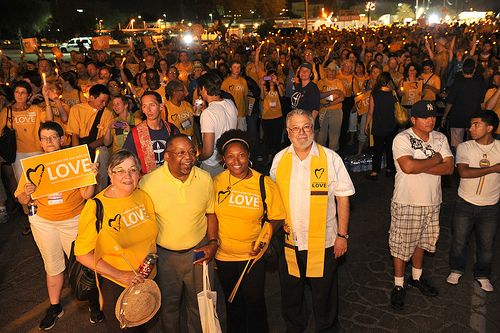 There are non-UU’s who have adopted the Standing on the Side of Love campaign as well. While most people identify the campaign with the UUA, it is understandably important to make sure that is not lost in translation when we show up in our t-shirts for local events. For the past year, we have made it possible for congregations to customize banners and t-shirts to include congregation names if they so choose. While we don’t have the capability right now, we are glad to give you our artwork to have a local, union vendor produce t-shirts that you can customize to include UUA identification or congregational identification on the apparel or banners. Standing on the Side of Love has always been envisioned as an open source campaign, and we love seeing the many banners and t-shirts that also with pride include personal identifiers! In May, while waiting for our congregation’s unit in the Gay Pride Parade to get moving, I wandered up and down the line-up, greeting friends from other (non-UU) congregations in our city, people I’ve worked with in grass-roots organizations, and especially in the “No on Prop. 8” campaign several years ago. One of them, a member of the First Congregation Church in Long Beach, said he wanted to own a SSL shirt like mine. Here’s my question: With the United Church of Christ Synod set to meet in Long Beach next June, what are the chances of spreading the “Love” campaign to the entire UUC at that time – much as it was introduced to our denomination at a General Assembly? I would love to see others wearing SSL shirts when we campaign for the local Living Wage ordinance, or for the state propositions opposing the death penalty and human trafficking, to mention just a few current public issues. But I would also like to have a parade SSL banner that has our congregation’s name and web address. I have been following the cnooersativns about this on the UUA- GA digest very sad it is a reprise of the anti-racist effort i.e. all UUs should go to Phoenix next year, all UUs should do immigrant work in their congregations, all UUs should be willing to fund this effort in AZ (notwithstanding that Arizona is only one state with this issue) and anyone who isn’t enthusiastic has failed the current litmus test the result? except for the ministers who might need/want something from the UUA, theological students who are going before the fellowship committee soon, and social justice activists for this issue the rest will vote with their feet and will not go to GA at all and will just avoid speaking, preaching or talking about the issue isn’t that the way it has always worked?